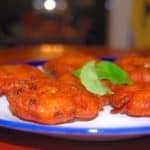 South Indian style crispy potato vada made with ginger, curry leaves and onions. Heat the oil in a pan wide enough to deep-fry in. If possible, use a thermometer to ensure it reaches between 350 and 375 degrees before you begin to fry. Make a ball of the potato dough, about 3/4 of an inch in diameter, and place it on your fingers. Using the thumb of the same hand, flatten it out into a disc, about 1 1/2 inches wide. Slip the wadas into the oil, as many as the pan will take at a time without becoming overcrowded. Fry each side until golden-brown. Serve hot with chutney or just enjoy by itself.